Why Choose the Principal Licensure Program? The Principal Licensure Program is designed for experienced teachers who desire to take on building level leadership positions, such as principal and assistant principal. PreK-12 schools of the 21st Century need principals who are instructional leaders with management expertise and people skills that allow them to lead their faculty and staff in ways that produce success for the students and the school. This program, which includes state and national standards-based coursework, field activities and a portfolio, prepares teachers to become high quality building-level leaders. Candidates seeking a principal license must have a current teaching license, at least two years of successful classroom teaching experience, and a recent master’s degree in Educational Leadership or an advised equivalent. Candidates with an expired professional license must complete the renewal requirements for their license prior to the granting of the principal license. Upon successful completion of the principal license program of study and passing the appropriate licensure exam*, the holder of a current professional teaching license is eligible for a principal license. *Please consult with a licensure advisor in the college’s Office of Student Services for current testing information. The Principal M.Ed. program provides a route to principal licensure for those who do not have a previous master’s degree in Educational Leadership. It should be noted that all applicants interested in entering the Principal Licensure-only program should seek to have their graduate-level transcripts evaluated prior to completing the application. This helps the evaluators determine the exact program of study. Please review the Frequently Asked Questions below to find out how and where to submit these transcripts. Admission is in Fall B, Spring B, and Summer B terms. Apply at least six weeks prior ro the term of enrollment. *NOTE: All applicants interested in entering the Principal Licensure-only program should seek to have their graduate-level transcripts evaluated prior to completing the application. This helps the evaluators determine the exact program of study. Please review the Frequently Asked Questions below to find out how and where to submit these transcripts. Complete the domestic (degree) application. Do not use the non-degree application. Three recommendation forms (effective for all applicants applying for Spring 2018 semester and thereafter). At least one of these forms must be from a direct supervisor -- principal, superintendent or other school administrator. Please see the Graduate School application for the required two-page recommendation forms. I already have a master's degree. Do I need to earn a second master's degree in order to qualify for a principal license? To qualify for the Principal Licensure-only program at WSU, applicants need to have a recent master’s degree in educational leadership or an advised equivalent like educational administration. 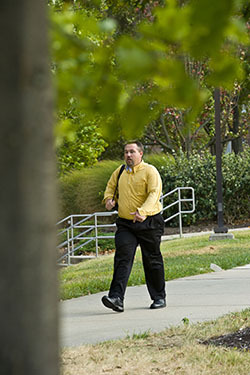 Those who have a previous master’s degree in a different educational area, such as reading, special education, science, etc., need to enter WSU’s Principal M.Ed. program so they may obtain both the leadership leveling courses, as well as the building-level leadership licensure courses necessary to not only become a well qualified building level leader but also to qualify for an Ohio Principal License. All applicants interested in entering the Principal Licensure-only program should seek to have their graduate-level transcripts evaluated prior to completing their application to determine their exact program of study. How can I know if my previous master’s degree could count as an “advised equivalent,” qualifying me for the Principal Licensure-only program? In general, to count as an advised equivalent to an educational leadership master’s degree, an applicant’s previous degree had to include such courses as school law, supervision of instruction, ethics and politics in education, student assessment, leadership for school improvement, curriculum analysis, and instructional leadership and change. In addition, these courses had to have been completed relatively recently (within the last seven years). The Educational Leadership team is happy to evaluate transcripts for previous graduate-level coursework to determine exactly which courses applicants would need to complete in order to qualify for an Ohio Principal License. Where do I send my previous graduate-level transcripts for review? Include both a phone number and an e-mail address where you can be reached. For this review process, official/original transcripts are not needed. A scanned or faxed copy will suffice. If you decide to apply to WSU’s program, the WSU Graduate School will require you to send official transcripts, but for the review process, a copy will work. If your previous graduate work was at Wright State, we have access to your transcripts. Simply contact the program director to request a transcript review. Additionally, if your transcript was under a different name, please be sure to let the program director know. Please allow approximately 10 business days for the review results. Upon completion of my principal program, how do I obtain my Principal License? To qualify for the license, completers of either the Principal M.Ed. or Principal Licensure-only program must successfully complete the required state licensure exam. Currently that exam is the Ohio Assessment for Educators (OAE) #015 Educational Leadership. At what point in my principal program should I take the state licensure exam? The principal licensure faculty strongly advise students to only take the licensure exam once they have completed all coursework in their program. The standards-based courses in both the Principal M.Ed. and Principal Licensure-only programs prepare students for the exam, and taking the exam prior to finishing coursework is not encouraged. If students choose to take the licensure exam during their final practicum course in the program, that is permissible, but taking the exam earlier than that is not advised. Consult the OAE website to learn about available test information and study guides.